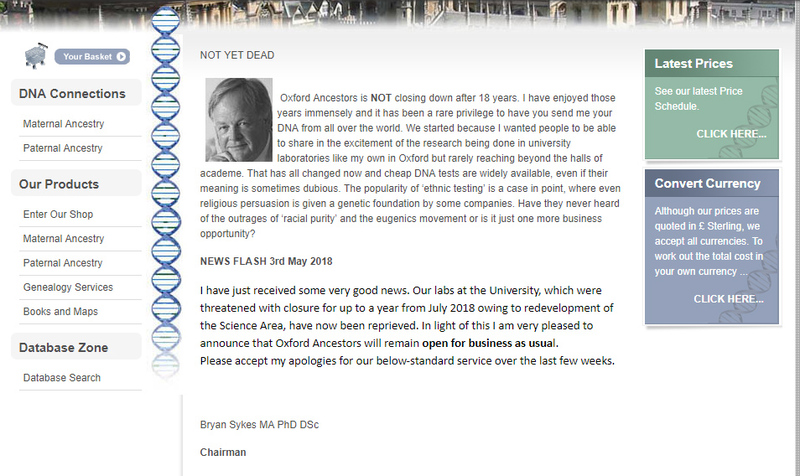 I wrote back in March this year that Oxford Ancestors was planning to close down this summer. I've now learnt that they have had a reprieve. The following newsflash was published on their website on 3rd May. Oxford Ancestors is NOT closing down after 18 years. I have enjoyed those years immensely and it has been a rare privilege to have you send me your DNA from all over the world. We started because I wanted people to be able to share in the excitement of the research being done in university laboratories like my own in Oxford but rarely reaching beyond the halls of academe. That has all changed now and cheap DNA tests are widely available, even if their meaning is sometimes dubious. The popularity of ‘ethnic testing’ is a case in point, where even religious persuasion is given a genetic foundation by some companies. Have they never heard of the outrages of ‘racial purity’ and the eugenics movement or is it just one more business opportunity? Please accept my apologies for our below-standard service over the last few weeks. Here is a screenshot from the Oxford Ancestors website captured by the Internet Archive on 23rd May 2018. Update. The updated ethnicity estimates were rolled out to the entire AncestryDNA database on 12th September 2018. See my blog post here for further details. 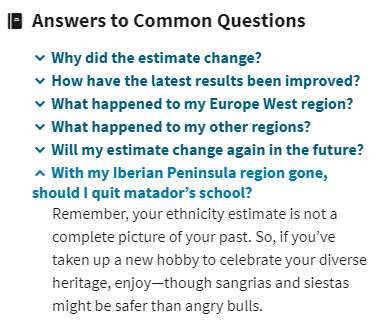 You can see the updated FAQs here. I have updated reports on my own Ancestry account and the accounts for my parents but not everyone is yet seeing the new reports. Apparently the updates are in the test phase until 12th June. Here are the updated reports for me and my parents. It may be that these reports will be updated again once the testing has been completed. On checking into my account I am given the option to preview my new estimate. Here's the updated report for my mum. 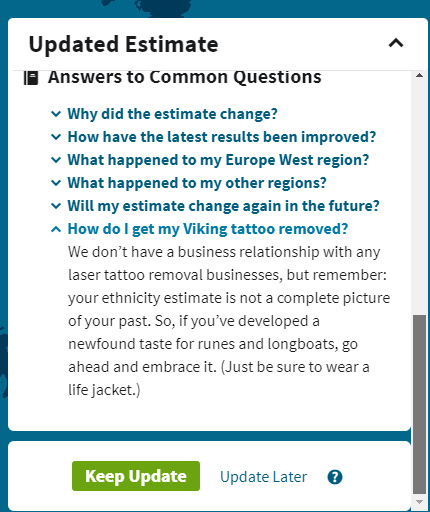 If you accept the new estimate it becomes your default. The page showing the differences between the old and new version is then no longer available so you might want to save a screenshot for reference. Note too that although the Regions are listed as Migrations in the preview, they revert to their previous status when you accept the new report. All my ancestors that I can trace in the last five or six generations are from England with the exception of one great-great-great grandfather on my dad's side from Scotland and one great-great-great grandmother on my mum's side from Ireland. Our updated reports are now a much better reflection of our recent genetic ancestry, though the 10% Norwegian and 3% Scandinavian in my dad's results appear to be an anomaly. I hope that, when the results are rolled out to all customers, Ancestry will publish an updated white paper with details of the new methodology and the new reference populations. I presume the massive percentage increase in the amount of our ancestry assigned to England and Wales is a reflection of the large number of people from these countries who are now in the AncestryDNA database I am sure that we can look forward to further refinements in the future. MyHeritage will be expiring all existing passwords over the next few days but you might prefer to change your password now rather than wait for the reminder. MyHeritage have responded impeccably to this incident with the rapid and transparent manner in which they disclosed the breach and the way that they are now requiring all users to change their passwords.